Optimum oral health and a pearly white smile is not a new concept for humans. Our ancestors were also concerned about their teeth and their appearance. This article contains fun and interesting dental facts and myths about dental history. As you enjoy this article, you may find helpful answers to trivia games, as well. Records from the Romans, around 200 AD, show they used advanced dental technology. They restored broken teeth with gold crowns and made fixed bridgework to close gaps from missing teeth. Records also show they made toothpaste from honey and crushed eggshells. Mummies from Egypt have been found with fillings made from resin and malachite. 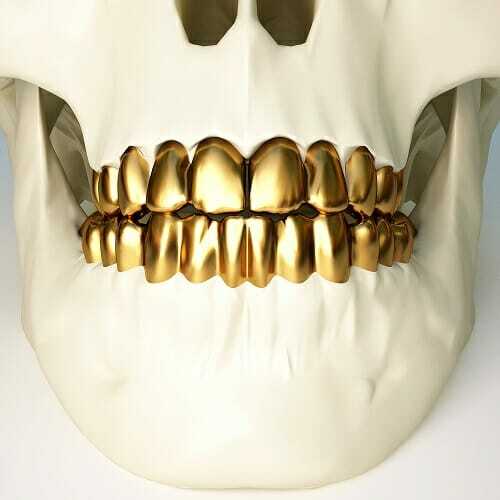 Some even have gold wires used to stabilize loose teeth. In early America, blacksmiths often served as dentists. A snail’s mouth, as small as the head of a pin, contains over 25,000 teeth! Everyone has a unique set of teeth. Even identical twins have different dental fingerprints. The stone-faced farmer in artist Grant Wood’s “American Gothic” painting was actually the artist’s dentist! In China, in 1498, the first bristle toothbrush was made from using hair from hogs, horses and badgers. The first commercial toothbrush was manufactured in 1938. The cotton candy machine was co-invented by a dentist. Before it was cotton candy, the fluffy treat was called “fairy floss”. The average person spends about 48 seconds per day brushing their teeth, however dentists recommend at least 3 minutes two times per day. It is estimated that 3 out of 4 Americans suffer from some form of gum disease, which is the leading cause of tooth loss for people over the age of 35. Flossing is the only way to clean 35% of your teeth’s surfaces that are missed by brushing alone. Along that line, 73% of Americans would rather go grocery shopping than floss! Americans spend $100 billion per year on hair care products, and only $2 billion a year on dental care products. Gum disease can be prevented.